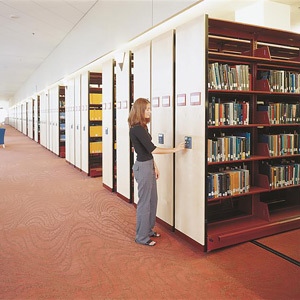 Spacesaver has vast experience providing fine art storage solutions. We understand how to protect precious works of art and optimize storage space to ensure any fine art collection continues to grow – and live on. Watch the video to see how Spacesaver fine art storage solutions helped the Delaware Art Museum grow their collection. Or download the case study! Spacesaver’s uniquely designed art storage racks conserve space and provide multiple level of security for paintings storage. Museum-grade cabinets are ideal for safe three-dimensional art storage, such as jewelry storage and ceramics storage. Single- or double-door models can be configured in any number of ways. Glass doors offer a full view of stored items, minimizing the need touch priceless objects. Smooth-gliding drawers or trays are perfect for organizing and protecting smaller items, or flat artwork. 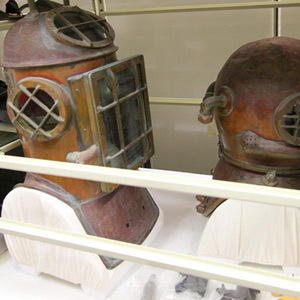 To save floor space and protect diverse collections of three-dimensional items, a museum storage specialist will often recommend one of Spacesaver’s Mobile Storage systems. 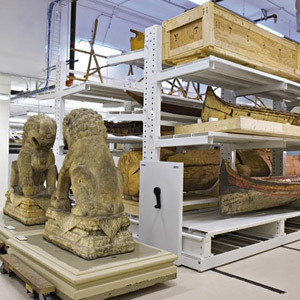 Mobile shelving for fine arts storage is specifically designed to safeguard collections of any significance or magnitude. 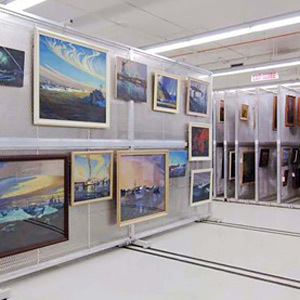 Depending on the size and diversity of your collection, any combination of art racks, cabinets, mobile storage systems, and fixed shelving systems might be necessary to create a comprehensive, reliable fine art storage solution that matches both the spatial footprint and the characteristics of the collection. You can count on a Spacesaver museum storage specialist to determine the right solution needed to preserve and protect your fine art collection.